You should know that toxins can enter your bloodstream on a daily basis. From the foods you consume, the air you breathe or your workplace with chemicals or certain kind of substances‚ and much more. Your body naturally is able to filter out dangerous toxins through your bladder and kidneys. Unfortunately‚ if toxins are entering in high dosages over an extended period of time than your bladder and kidneys works really hard to detect and eliminate toxins. Hence, it is important to keep these organs healthy. Your diet should include low mercury-containing seafood, unprocessed foods and reduce alcohol intake. Alternatively, you can also take a supplement like Biotics Research’s Argizyme to keep your kidneys and bladder properly working. 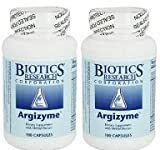 This article is all about Argizyme Reviews, Side Effects and More. Argizyme is a scientifically formulated dietary supplement with methyl donors. It is a simple, specific and convenient way to support and promote optimal kidney and bladder function. Its unique blend of botanicals, amino acids, enzymes, vitamins, minerals and organ specific support supports kidney and bladder wellbeing. The number of nutrients, vitamins, and herbal extracts such as Spanish moss, beetroot extract and more, all promote proper organs function. One bottle contains 100 capsules which last for over three month period. This product is beneficial for people wishing to support normal urinary tract function. Argizyme is a scientifically formulated dietary supplement with methyl donors. It is a simple, specific and convenient way to support and promote optimal kidney and bladder function. Argizyme Biotics Research contains a unique blend of botanicals, amino acids, enzymes, vitamins, minerals, and organ specific support. It contains Vitamin A that supports normal vision and immune function. Vitamin E is an antioxidant supporting the cells against damage caused by free radicals. The L-leucine‚ an essential amino acid and rice bran powder are crucial components for normal kidney function. Argizyme is an enzymatically processed formula containing organic beet and Tillandsia. Tillandsia is Silver Spanish Moss. It also has rice bran in a base of vitamins, minerals, amino acids, molasses and a specially grown, biologically active vegetable culture containing trace elements, SOD, and catalase. It includes the enzyme arginase, an element needed to normalize the Urea Cycle. Each tablet will keep your urinary tract functioning optimally with ingredients such as – rice bran powder which assists the kidneys in supporting cardiovascular health while providing vitamin E‚ an antioxidant that protects the cells against damage caused by free radicals. L-leucine‚ an essential amino acid also protects your kidneys. This is a Dairy Free and Gluten Free product. As a dietary supplement, you should take one capsule three times a day or otherwise directed by a healthcare professional. With this dosage, your one bottle containing 100-capsule bottle will last for a little over three months. This wonderful product indicated for – General and renal hypertension, benign prostate hypertrophy, symptoms of kidney/bladder dysfunction, male impotence (nitric oxide precursor), and edema. People have seen excellent results with certain types of essential hypertension. Moreover, it generally does not take long to bring blood pressure down. Biotics Research formulates and manufactures innovative supplements. Its own research and development team discovers and analyzes benefits of new ingredients going into their formulation. In addition‚ all products supplied by Biotics Research have demonstrated to be effective and safe. Hence, Argizyme is safe to use and has no known side effects. However, hypersensitivity can rarely occur, in such case discontinue use. Consult your healthcare provider before taking this supplement. People opinion about this product is good. They say it is very effective to remove the toxins from the body and has a good price too. For Sarah, this is a God send product. She is having medullary sponge kidney disease in which uric acid builds up in kidneys. This product has helped to relieve the pain from build-up. She takes 4 capsules a day and it helps to keep the uric acid flushed out. She is thankful to the company and says it easily relieves her pain by controlling uric acid levels. Barb’s doctor prescribed this and he says it really works to remove the toxins from the body. He notices the difference when he skips the tablet. Melissa’s husband is having impotency problem. But this supplement has helped him with impotency and has clearer urine now. If you are looking for a kidney and bladder support dietary supplement, then go for Argizyme. Owing to its ingredients, positive customer reviews, it is worth a buy.